Nicola Zaccaria, Bass Vocals, MainArtist - Walter Legge, Producer - Herbert Von Karajan, Conductor, MainArtist - Orchestra Del Teatro Alla Scala, Milano, MainArtist - Giuseppe Verdi, Composer - Coro Del Teatro Alla Scala Di Milano, Chorus - Robert Beckett, Balance Engineer - Orchestra Del Teatro Alla Scala Di Milano, Orchestra - Coro del Teatro alla Scala, Milano, MainArtist Auteursrecht : 2010 EMI Records Ltd. 1957 The copyright in this sound recording is owned by EMI Italiana SpA. Digital remastering (P) 2004 by EMI Italiana SpA. Walter Legge, Producer - Herbert Von Karajan, Conductor, MainArtist - Orchestra Del Teatro Alla Scala, Milano, MainArtist - Giuseppe Verdi, Composer - Maria Callas, Soprano Vocals, MainArtist - Luisa Villa, Mezzo-soprano Vocals, MainArtist - Robert Beckett, Balance Engineer - Orchestra Del Teatro Alla Scala Di Milano, Orchestra Auteursrecht : 2010 EMI Records Ltd. 1957 The copyright in this sound recording is owned by EMI Italiana SpA. Digital remastering (P) 2004 by EMI Italiana SpA. 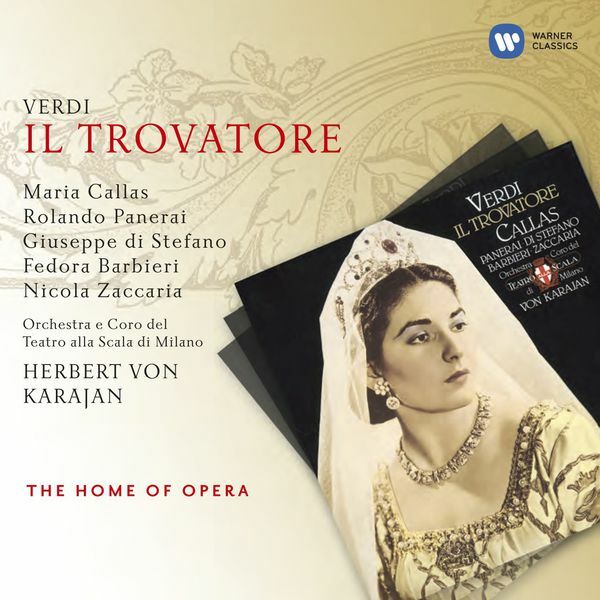 Walter Legge, Producer - Herbert Von Karajan, Conductor, MainArtist - Orchestra Del Teatro Alla Scala, Milano, MainArtist - Giuseppe Verdi, Composer - Maria Callas, Soprano Vocals, MainArtist - Robert Beckett, Balance Engineer - Orchestra Del Teatro Alla Scala Di Milano, Orchestra Auteursrecht : 2010 EMI Records Ltd. 1957 The copyright in this sound recording is owned by EMI Italiana SpA. Digital remastering (P) 2004 by EMI Italiana SpA. Walter Legge, Producer - Herbert Von Karajan, Conductor, MainArtist - Orchestra Del Teatro Alla Scala, Milano, MainArtist - Giuseppe Verdi, Composer - Maria Callas, Soprano Vocals, MainArtist - Luisa Villa, Mezzo-soprano Vocals - Robert Beckett, Balance Engineer - Orchestra Del Teatro Alla Scala Di Milano, Orchestra Auteursrecht : 2010 EMI Records Ltd. 1957 The copyright in this sound recording is owned by EMI Italiana SpA. Digital remastering (P) 2004 by EMI Italiana SpA. Walter Legge, Producer - Herbert Von Karajan, Conductor, MainArtist - Orchestra Del Teatro Alla Scala, Milano, MainArtist - Giuseppe Verdi, Composer - Rolando Panerai, Baritone Vocals, MainArtist - Robert Beckett, Balance Engineer - Orchestra Del Teatro Alla Scala Di Milano, Orchestra Auteursrecht : 2010 EMI Records Ltd. 1957 The copyright in this sound recording is owned by EMI Italiana SpA. Digital remastering (P) 2004 by EMI Italiana SpA. Walter Legge, Producer - Herbert Von Karajan, Conductor, MainArtist - Orchestra Del Teatro Alla Scala, Milano, MainArtist - Giuseppe Verdi, Composer - Rolando Panerai, Baritone Vocals, MainArtist - Giuseppe Di Stefano, Tenor Vocals, MainArtist - Robert Beckett, Balance Engineer - Orchestra Del Teatro Alla Scala Di Milano, Orchestra Auteursrecht : 2010 EMI Records Ltd. 1957 The copyright in this sound recording is owned by EMI Italiana SpA. Digital remastering (P) 2004 by EMI Italiana SpA. Walter Legge, Producer - Herbert Von Karajan, Conductor, MainArtist - Orchestra Del Teatro Alla Scala, Milano, MainArtist - Giuseppe Verdi, Composer - Rolando Panerai, Baritone Vocals, MainArtist - Maria Callas, Soprano Vocals, MainArtist - Giuseppe Di Stefano, Tenor Vocals, MainArtist - Robert Beckett, Balance Engineer - Orchestra Del Teatro Alla Scala Di Milano, Orchestra Auteursrecht : 2010 EMI Records Ltd. 1957 The copyright in this sound recording is owned by EMI Italiana SpA. Digital remastering (P) 2004 by EMI Italiana SpA. Walter Legge, Producer - Herbert Von Karajan, Conductor, MainArtist - Orchestra Del Teatro Alla Scala, Milano, MainArtist - Giuseppe Verdi, Composer - Coro Del Teatro Alla Scala Di Milano, Chorus - Robert Beckett, Balance Engineer - Orchestra Del Teatro Alla Scala Di Milano, Orchestra - Coro del Teatro alla Scala, Milano, MainArtist Auteursrecht : 2010 EMI Records Ltd. 1957 The copyright in this sound recording is owned by EMI Italiana SpA. Digital remastering (P) 2004 by EMI Italiana SpA. Walter Legge, Producer - Herbert Von Karajan, Conductor, MainArtist - Orchestra Del Teatro Alla Scala, Milano, MainArtist - Giuseppe Verdi, Composer - Fedora Barbieri, Contralto Vocals, MainArtist - Robert Beckett, Balance Engineer - Orchestra Del Teatro Alla Scala Di Milano, Orchestra Auteursrecht : 2010 EMI Records Ltd. 1957 The copyright in this sound recording is owned by EMI Italiana SpA. Digital remastering (P) 2004 by EMI Italiana SpA. Walter Legge, Producer - Herbert Von Karajan, Conductor, MainArtist - Orchestra Del Teatro Alla Scala, Milano, MainArtist - Giuseppe Verdi, Composer - Coro Del Teatro Alla Scala Di Milano, Chorus - Giuseppe Di Stefano, Tenor Vocals, MainArtist - Fedora Barbieri, Contralto Vocals, MainArtist - Giulio Mauri, Baritone Vocals, MainArtist - Robert Beckett, Balance Engineer - Orchestra Del Teatro Alla Scala Di Milano, Orchestra - Coro del Teatro alla Scala, Milano, MainArtist Auteursrecht : 2010 EMI Records Ltd. 1957 The copyright in this sound recording is owned by EMI Italiana SpA. Digital remastering (P) 2004 by EMI Italiana SpA. Walter Legge, Producer - Herbert Von Karajan, Conductor, MainArtist - Orchestra Del Teatro Alla Scala, Milano, MainArtist - Giuseppe Verdi, Composer - Giuseppe Di Stefano, Tenor Vocals, MainArtist - Fedora Barbieri, Contralto Vocals, MainArtist - Robert Beckett, Balance Engineer - Orchestra Del Teatro Alla Scala Di Milano, Orchestra Auteursrecht : 2010 EMI Records Ltd. 1957 The copyright in this sound recording is owned by EMI Italiana SpA. Digital remastering (P) 2004 by EMI Italiana SpA. Walter Legge, Producer - Herbert Von Karajan, Conductor, MainArtist - Orchestra Del Teatro Alla Scala, Milano, MainArtist - Giuseppe Verdi, Composer - Renato Ercolani, Tenor Vocals, MainArtist - Giuseppe Di Stefano, Tenor Vocals, MainArtist - Fedora Barbieri, Contralto Vocals, MainArtist - Robert Beckett, Balance Engineer - Orchestra Del Teatro Alla Scala Di Milano, Orchestra Auteursrecht : 2010 EMI Records Ltd. 1957 The copyright in this sound recording is owned by EMI Italiana SpA. Digital remastering (P) 2004 by EMI Italiana SpA. Nicola Zaccaria, Bass Vocals - Walter Legge, Producer - Herbert Von Karajan, Conductor - Giuseppe Verdi, Composer - Rolando Panerai, Baritone Vocals - Robert Beckett, Balance Engineer - Orchestra Del Teatro Alla Scala Di Milano, Orchestra - Maria Callas/Rolando Panerai/Fedora Barbieri/Giuseppe di Stefano/Nicola Zaccaria/Luisa Villa/Renato Ercolani/Giulio Mauri/Coro del Teatro alla Scala, Milano/Coro e Orchestra del Teatro alla Scala, Milano/Orchestra del Teatro alla Scala, Milano/Herbert von, MainArtist Auteursrecht : 2010 EMI Records Ltd. 1957 The copyright in this sound recording is owned by EMI Italiana SpA. Digital remastering (P) 2004 by EMI Italiana SpA. Walter Legge, Producer - Herbert Von Karajan, Conductor, MainArtist - Orchestra Del Teatro Alla Scala, Milano, MainArtist - Giuseppe Verdi, Composer - Rolando Panerai, Baritone Vocals, MainArtist - Robert Beckett, Balance Engineer - Orchestra Del Teatro Alla Scala Di Milano, Orchestra - Coro del Teatro alla Scala, Milano, MainArtist Auteursrecht : 2010 EMI Records Ltd. 1957 The copyright in this sound recording is owned by EMI Italiana SpA. Digital remastering (P) 2004 by EMI Italiana SpA. Nicola Zaccaria, Bass Vocals, MainArtist - Walter Legge, Producer - Herbert Von Karajan, Conductor, MainArtist - Orchestra Del Teatro Alla Scala, Milano, MainArtist - Giuseppe Verdi, Composer - Rolando Panerai, Baritone Vocals, MainArtist - Coro Del Teatro Alla Scala Di Milano, Chorus - Robert Beckett, Balance Engineer - Orchestra Del Teatro Alla Scala Di Milano, Orchestra - Coro del Teatro alla Scala, Milano, MainArtist Auteursrecht : 2010 EMI Records Ltd. 1957 The copyright in this sound recording is owned by EMI Italiana SpA. Digital remastering (P) 2004 by EMI Italiana SpA. Walter Legge, Producer - Herbert Von Karajan, Conductor, MainArtist - Orchestra Del Teatro Alla Scala, Milano, MainArtist - Giuseppe Verdi, Composer - Rolando Panerai, Baritone Vocals, MainArtist - Maria Callas, Soprano Vocals, MainArtist - Coro Del Teatro Alla Scala Di Milano, Chorus - Luisa Villa, Mezzo-soprano Vocals, MainArtist - Robert Beckett, Balance Engineer - Orchestra Del Teatro Alla Scala Di Milano, Orchestra - Coro del Teatro alla Scala, Milano, MainArtist Auteursrecht : 2010 EMI Records Ltd. 1957 The copyright in this sound recording is owned by EMI Italiana SpA. Digital remastering (P) 2004 by EMI Italiana SpA. Nicola Zaccaria, Bass Vocals, MainArtist - Walter Legge, Producer - Herbert Von Karajan, Conductor - Giuseppe Verdi, Composer - Rolando Panerai, Baritone Vocals, MainArtist - Maria Callas, Soprano Vocals, MainArtist - Renato Ercolani, Tenor Vocals, MainArtist - Coro Del Teatro Alla Scala Di Milano, Chorus - Giuseppe Di Stefano, Tenor Vocals, MainArtist - Luisa Villa, Mezzo-soprano Vocals, MainArtist - Robert Beckett, Balance Engineer - Orchestra Del Teatro Alla Scala Di Milano, Orchestra Auteursrecht : 2010 EMI Records Ltd. 1957 The copyright in this sound recording is owned by EMI Italiana SpA. Digital remastering (P) 2004 by EMI Italiana SpA. Nicola Zaccaria, Bass Vocals, MainArtist - Walter Legge, Producer - Herbert Von Karajan, Conductor, MainArtist - Orchestra Del Teatro Alla Scala, Milano, MainArtist - Giuseppe Verdi, Composer - Rolando Panerai, Baritone Vocals, MainArtist - Coro Del Teatro Alla Scala Di Milano, Chorus - Fedora Barbieri, Contralto Vocals, MainArtist - Robert Beckett, Balance Engineer - Orchestra Del Teatro Alla Scala Di Milano, Orchestra - Coro del Teatro alla Scala, Milano, MainArtist Auteursrecht : 2010 EMI Records Ltd. 1957 The copyright in this sound recording is owned by EMI Italiana SpA. Digital remastering (P) 2004 by EMI Italiana SpA. Walter Legge, Producer - Herbert Von Karajan, Conductor, MainArtist - Orchestra Del Teatro Alla Scala, Milano, MainArtist - Giuseppe Verdi, Composer - Maria Callas, Soprano Vocals, MainArtist - Giuseppe Di Stefano, Tenor Vocals, MainArtist - Robert Beckett, Balance Engineer - Orchestra Del Teatro Alla Scala Di Milano, Orchestra Auteursrecht : 2010 EMI Records Ltd. 1957 The copyright in this sound recording is owned by EMI Italiana SpA. Digital remastering (P) 2004 by EMI Italiana SpA. Walter Legge, Producer - Herbert Von Karajan, Conductor - Giuseppe Verdi, Composer - Giuseppe Di Stefano, Tenor Vocals - Robert Beckett, Balance Engineer - Orchestra Del Teatro Alla Scala Di Milano, Orchestra - Giuseppe di Stefano/Orchestra del Teatro alla Scala, Milano/Herbert von Karajan, MainArtist Auteursrecht : 2010 EMI Records Ltd. 1957 The copyright in this sound recording is owned by EMI Italiana SpA. Digital remastering (P) 2004 by EMI Italiana SpA. Walter Legge, Producer - Herbert Von Karajan, Conductor, MainArtist - Orchestra Del Teatro Alla Scala, Milano, MainArtist - Giuseppe Verdi, Composer - Maria Callas, Soprano Vocals, MainArtist - Renato Ercolani, Tenor Vocals, MainArtist - Giuseppe Di Stefano, Tenor Vocals, MainArtist - Robert Beckett, Balance Engineer - Orchestra Del Teatro Alla Scala Di Milano, Orchestra Auteursrecht : 2010 EMI Records Ltd. 1957 The copyright in this sound recording is owned by EMI Italiana SpA. Digital remastering (P) 2004 by EMI Italiana SpA. Walter Legge, Producer - Herbert Von Karajan, Conductor, MainArtist - Orchestra Del Teatro Alla Scala, Milano, MainArtist - Giuseppe Verdi, Composer - Maria Callas, Soprano Vocals - Renato Ercolani, Tenor Vocals, MainArtist - Coro Del Teatro Alla Scala Di Milano, Chorus - Giuseppe Di Stefano, Tenor Vocals, MainArtist - Robert Beckett, Balance Engineer - Orchestra Del Teatro Alla Scala Di Milano, Orchestra - Coro del Teatro alla Scala, Milano, MainArtist Auteursrecht : 2010 EMI Records Ltd. 1957 The copyright in this sound recording is owned by EMI Italiana SpA. Digital remastering (P) 2004 by EMI Italiana SpA. Walter Legge, Producer - Herbert Von Karajan, Conductor, MainArtist - Orchestra Del Teatro Alla Scala, Milano, MainArtist - Giuseppe Verdi, Composer - Maria Callas, Soprano Vocals, MainArtist - Renato Ercolani, Tenor Vocals, MainArtist - Robert Beckett, Balance Engineer - Orchestra Del Teatro Alla Scala Di Milano, Orchestra Auteursrecht : 2010 EMI Records Ltd. 1957 The copyright in this sound recording is owned by EMI Italiana SpA. Digital remastering (P) 2004 by EMI Italiana SpA. Walter Legge, Producer - Herbert Von Karajan, Conductor - Giuseppe Verdi, Composer - Maria Callas, Soprano Vocals - Coro Del Teatro Alla Scala Di Milano, Chorus - Giuseppe Di Stefano, Tenor Vocals - Robert Beckett, Balance Engineer - Orchestra Del Teatro Alla Scala Di Milano, Orchestra - Maria Callas/Giuseppe di Stefano/Coro del Teatro alla Scala, Milano/Orchestra del Teatro alla Scala, Milano/Herbert von Karajan, MainArtist Auteursrecht : 2010 EMI Records Ltd. 1957 The copyright in this sound recording is owned by EMI Italiana SpA. Digital remastering (P) 2004 by EMI Italiana SpA. Walter Legge, Producer - Herbert Von Karajan, Conductor, MainArtist - Orchestra Del Teatro Alla Scala, Milano, MainArtist - Giuseppe Verdi, Composer - Rolando Panerai, Baritone Vocals, MainArtist - Maria Callas, Soprano Vocals, MainArtist - Robert Beckett, Balance Engineer - Orchestra Del Teatro Alla Scala Di Milano, Orchestra Auteursrecht : 2010 EMI Records Ltd. 1957 The copyright in this sound recording is owned by EMI Italiana SpA. Digital remastering (P) 2004 by EMI Italiana SpA. Walter Legge, Producer - Herbert Von Karajan, Conductor, MainArtist - Orchestra Del Teatro Alla Scala, Milano, MainArtist - Giuseppe Verdi, Composer - Maria Callas, Soprano Vocals, MainArtist - Giuseppe Di Stefano, Tenor Vocals, MainArtist - Fedora Barbieri, Contralto Vocals - Robert Beckett, Balance Engineer - Orchestra Del Teatro Alla Scala Di Milano, Orchestra Auteursrecht : 2010 EMI Records Ltd. 1957 The copyright in this sound recording is owned by EMI Italiana SpA. Digital remastering (P) 2004 by EMI Italiana SpA. Walter Legge, Producer - Herbert Von Karajan, Conductor, MainArtist - Orchestra Del Teatro Alla Scala, Milano, MainArtist - Giuseppe Verdi, Composer - Rolando Panerai, Baritone Vocals, MainArtist - Maria Callas, Soprano Vocals, MainArtist - Giuseppe Di Stefano, Tenor Vocals, MainArtist - Fedora Barbieri, Contralto Vocals, MainArtist - Robert Beckett, Balance Engineer - Orchestra Del Teatro Alla Scala Di Milano, Orchestra Auteursrecht : 2010 EMI Records Ltd. 1957 The copyright in this sound recording is owned by EMI Italiana SpA. Digital remastering (P) 2004 by EMI Italiana SpA.